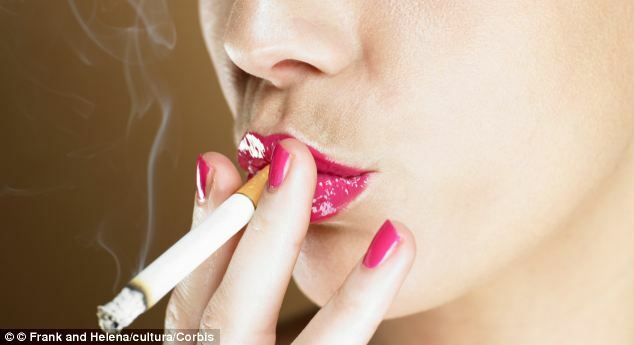 We all know smoking is terrible for health and linked to a host of diseases. 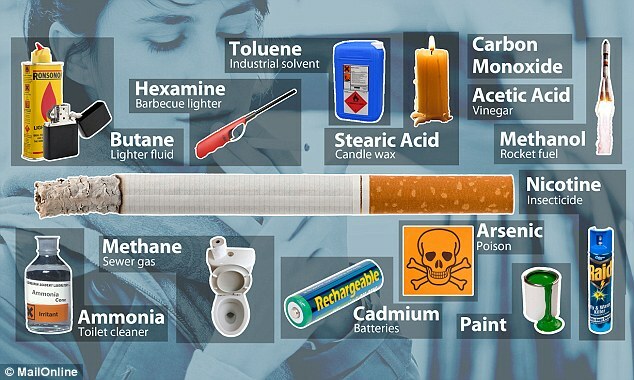 But this eye-opening graphic highlights exactly what goes into cigarettes – and makes for very unpleasant reading. From nail polish remover to rat poison, one website has revealed some of the most shocking cigarette ingredients. Smoke Free Forsyth, a website dedicated to helping the people of Forsyth County, North Carolina, give up smoking, explains how cigarettes contain more than 4,000 chemicals – and that many are similar to substances found in toxic waste dumps. It says they contain acetone, which is nail polish remover, and ammonia, which is a household cleaner as well as the sewer gas methane and barbecue lighter, hazamine. They also contain arsenic, which used to be used in rat poison, butane which is used in lighter fuel and vinegar. Carbon monoxide, a poisonous gas, paint, and cadmium, which is used in batteries, are also included. Then there’s the deadly poison cyanide and a banned insecticide called DDT. Cigarettes also contain formaldehyde, which is used to preserve dead animals, and hydrazine – a rocket fuel – as well as an acid found in candle wax. Cigarettes remain the leading cause of preventable death in the U.S. They also contain lead, which is poisonous in high doses, and polonium – a cancer-causing radioactive element. ‘One of the issues with cigarettes is that they have hundreds of added ingredients, not just what is naturally in the tobacco plant,’ Dr Luz Claudio, an environmental health scientist with Mount Sinai School of Medicine, told Medical Daily. The American Lung Association says that at least 69 of the chemicals found in cigarette smoke are known to cause cancer and that many are poisonous. The organisation says smoking remains the leading cause of preventable death in the U.S. and that secondhand smoke causes about 50,000 deaths each year.